Salt marshes help fight erosion, reduce storm surge, and shelter thousands of dollars worth of seafood per acre. How does diversity help the salt marsh? This is what Dr. Randall Hughes is trying to find out in her NSF funded study. Salt marshes are productive ecosystems that are facing massive die-off. Does having a greater genetic diversity within a marsh’s foundation species, smooth cordgrass (Spartina alterniflora) make it less susceptible to disturbances such as drought? Do certain combinations of plants and animals make for a stronger marsh? Marshes are as productive a habitat as oyster reefs, and just as vulnerable to drought. Randall Hughes looks at how biodiversity makes a salt marsh more resistant to loss. It’s hard to see, but marsh cordgrass plants have their own personalities. Genetic diversity among the plants may benefit the salt marsh, along with the critters that rely on it. 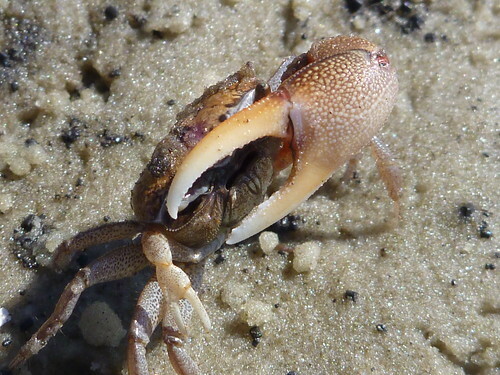 Those critters may benefit the salt marsh, too, particularly fiddler crabs and mussels. Randall looks at how diversity of both plant and animals (species diversity) can make a healthy salt marsh. Not all combinations of plants are good for the marsh. Randall investigates the increasing black mangrove population of the SJB salt marsh and the effects it may leave on the marsh. Some disturbances may be beneficial to the salt marsh. So is Seagrass wrack in the marsh a destroyer, or provider of nutrients and habitat for the these plant and animal species? Randall’s study is funded by the National Science Foundation.